One of the main benefits of investing in smart home devices for your Sacramento home is the money that you can save. While the devices are going to require an investment to purchase and install them, the home automation market is booming and there is enough competition on the market to keep the costs of the devices relatively low for the high quality that you’ll get. Because many of the devices will help save you money, they can actually end up paying for themselves over time. Here are some of the sometimes surprising ways that investing in home automation with smart home devices can help you save! Making it cheaper to heat and cool your home. One of the most popular smart home devices are smart thermostats. These devices help to regulate the temperature in your home and ensure that you aren’t paying too much to heat and cool your house when no one is home. They take the convenience of programming an electronic thermostat and add more features like being able to adjust the temperature from your smartphone. Some devices even learn your home’s unique schedule and tailor your heating and cooling to those patterns. By ensuring that you aren’t heating or cooling your home when it isn’t necessary, you’ll stop paying too much on your monthly energy bill. Turning on and off lights automatically. Smart lighting offers a number of benefits including the ability to set up lighting schemes and (with the right equipment) turn lights on and off by simply using your voice. But one of the coolest things that it can do is help you turn on and off lights automatically. If you want to ensure you have a light on when you come home in the evening, there is no need to leave that light on all day. You can set a timer so that light comes on a few minutes before your expected arrival time. This gives you the safety of a well-lit home upon your arrival without paying to keep the light on all day. Many smart lights also allow you to turn them on and off remotely using an app, meaning you can check to see if you accidentally left any lights on at home and turn them off from anywhere in the world. That means you aren’t wasting any energy and running up your monthly bill. Preventing devices from using energy when not in use. Your electronics can use electricity even when you aren’t using them simply by being plugged into the wall. There are a number of devices to help put a stop to this. Smart power strips allow you to turn on and off the power supply to devices so you can ensure they are powered when you need them but aren’t wasting energy when they aren’t in use. Because this is a major problem with today’s energy usage, you’ll likely see even more devices coming to the market in the next year that addresses this slow energy drain on your home. All of them will not only lower your energy bills, but they’ll help make your home more eco-friendly, too. Increasing security and preventing theft. A theft in your home can not only have a big price tag, it can take an emotional toll on your family as well. Package theft is becoming a bigger problem as more and more families are relying on services such as Amazon to deliver items to their home when they aren’t there. Things like smart doorbells and smart locks can help you give the delivery guy access to safe storage areas without leaving your packages out in the open. There are also a lot of smart devices that can help you secure your home from unwanted visitors, including remote monitoring systems that allow you to take a peek at what’s happening inside your home no matter where you are in the world. Not only can you prevent losing money through stolen items, you can pay for peace of mind (and that can be priceless). Helping you use less water. There are a number of smart home devices on the market that are aimed at helping reduce water usage in the home. These devices can be especially important in areas like California that are experiencing drought conditions, as they’ll reduce water waste as well as help you save on your monthly water bill. These devices attach to the sink or shower and monitor how much water you are using during your tasks. Many devices use digital readouts or even color coding to help you know when you are using too much water. You’ll be able to check reports on your smartphone and see how much water you are using and where the majority of it’s being used in your home, giving you more insight into how you can cut down usage and help save. Ready to Start Saving on Your Monthly Bills? 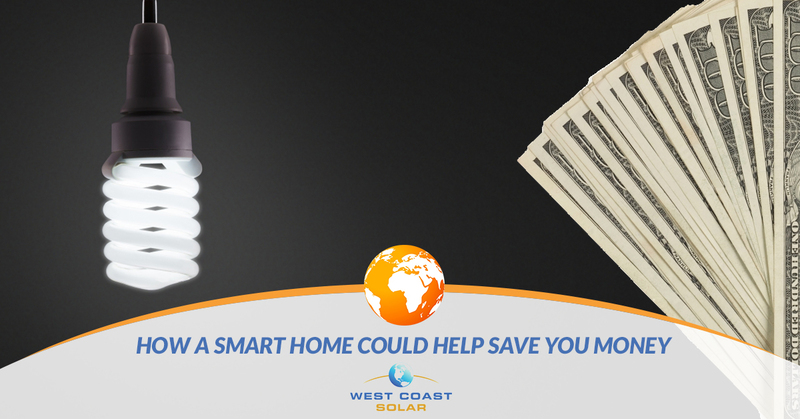 If you are curious about how much a smart home could help you save, West Coast Solar can help you get started. We’re more than a solar panel installation company! We also offer services to help you automate your home such as choosing the right devices, getting them installed, and even teaching you to use them. Simply give our team a call or fill out the form on our website and someone will be in touch with you right away. We can give you a free estimate on our smart home services and discuss your home’s needs with you in detail!